Tandav is a chic restaurant on Sutton's High Street. They offer a wide choice of Southern Indian cuisine as well as an extensive drinks list to complement your meal. Do you work at Tandav? What did you think of Tandav? A decent South Indian restaurant in suburban Sutton, Tandav offers something different for fans of Indian food. Located at the bottom of the high street, Tandav’s surroundings are unfortunately not the best. In the shadow of a huge, looming Asda and surrounded by a few kebab shops, Tandav’s colourful decor makes it stand out even from the street. The colour scheme of bright purple and vivid orange is certainly memorable, although the orange is probably taking it a step too far. Tandav features floor to ceiling windows that, on a different street, would make for a good view of passersby – instead you’re treated to a steady flow of moody teens messing around outside the kebab shop and chavs with angry-looking dogs on chain leads. The clientele, though, seems to be mostly made up of families with young children and older couples. 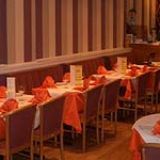 As Tandav is still quite new, they seem to be mainly loyal regulars of the previous Indian restaurant that was located on the premises previously. 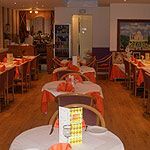 Tandav has kept on the staff from the other restaurant, who warmly and kindly greet everyone who comes in the door as if they were family. Staff are also happy to explain the menu, which features many South Indian dishes that aren’t the norm in many suburban Indian restaurants. Although all the classic British favourites are there (chicken tikka masala, lamb rogan josh) the menu mainly concentrates on seafood and vegetarian dishes which are favourites of South Indian cuisine. There are a few varieties of dosas, a version of a crepe made with lentils and rice. The prawn masala dosa (£5.95), though, is pretty disappointing as the shrimp, potato and onion filling seems cold, and although chillis are mentioned in the ingredients the filling is mild and verging on bland. An accompanying dish of sambar is also very bland meaning that the pale green coconut chutney has nothing to cool down. Things pick up a bit with a main course of Alleppey konju curry (£7.50) which includes large, well cooked prawns and a sauce made from coconut, ginger, lemon and curry leaves – this could also be a bit spicier but there’s a nice blend of flavours. Mutter paneer (£4.95), a curry made with peas and homemade cubes of cheese, is also good although the cheese is just slightly too rubbery. Pilau rice and lemon rice (£2.50) are cooked well although the lemon rice is an unnecessarily lurid yellow colour. Where Tandav does stand out is its unusual selection of side dishes including options like green bananas, carrot poriyal (carrots cooked with onions, coconut and mustard seeds) and beetroot thoran (£2.95), small cubes of beetroot sprinkled with ground coconut and mustard seeds. It has a sharp, tangy flavour and the beetroot is vibrant and fresh. For dessert, gulab jamun seem freshly made and taste sickly sweet, just as they should. There are a few choices of international wines from about £10 to £20 a bottle, although there are only two whites and two reds available by the glass. Large bottles of Cobra and Kingfish are also on offer, along with spirits, soft drinks and sweet, salty and mango lassis. Tandav deserves praise for bringing a lesser known type of Indian food to an area where kebabs are king. Prices are low and although the flavours could do with a bit more spice, the staff are so sweet that locals will likely forgo their weekly tikka masala for something a bit more unique.